Let us leave town for today and head south to Valencia, to admire Santiago Calatrava’s masterwork, the City of Art and Science. The Valencian architect Calatrava is known for having built bridges in Venice, Jerusalem, a train station in Lisbon, and many more things around the world, Athens, Milwaukee, Lyon in France, and so on. Have a look at his website, it is most definitely worth at least one visit. And here is what Wiki has to say about him. As for the photo, it is an attempt to playing around with HDR. This entry was posted on November 13, 2010 by robthefrog. 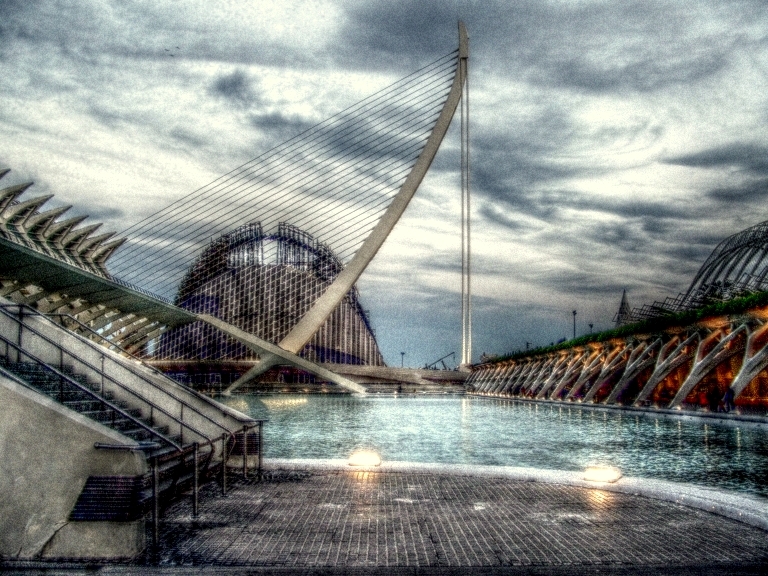 It was filed under architecture, art, bridges, Valencia . Wow, what an image you've made here. Wow, what a huge project! Beautiful. And your playing around with the photo makes it like a dream place. But I still like our Calatrava bridge in Jerusalem best.